NFL football is finally back! The first week of the 2018 season was filled with plenty of twists and turns and gave us plenty to talk about. Thanks to surprise defenses, stunning upsets and even a tie, 2018’s Week 1 will be remembered for a long time. Here are the top five studs and duds from Week 1 of the 2018 NFL season before Week 2 gets started tomorrow. Aaron Rodgers is a pretty good quarterback. The star passer for Green Bay gave fans yet another instant classic performance in the Packers’ comeback win over the Bears Sunday Night. Rodgers suffered what seemed to be a serious leg injury in the first half and many speculated whether it would be season ending. He turned out to be fine however and returned to the game despite the team’s 20-0 deficit. He then proceeded to lead his team to to a wild fourth quarter comeback that saw him throw three absurd touchdown passes…… with only one healthy leg. Roethlisberger turned the ball over five times in the form of three interceptions and two fumbles to allow the Browns to claw their way back into the game. His sack fumble in overtime should’ve been enough to give the Browns the game if not for some heroics by Pittsburgh’s special teams. Pittsburgh usually starts slow and should be expected to bounce back, but it was not a good 2018 debut for the Steelers and their quarterback. James Connor is getting all the love from Steelers fans right now and deservedly so, but their best player Week 1 played on the other side of the ball. T.J. Watt was an absolute monster at First Energy stadium and made his presence felt all over the field. He recorded a whopping four sacks among his 11 tackles and excelled in coverage when asked to drop back. Watt was also responsible for the field goal block in overtime that allowed Pittsburgh to salvage a tie. Pittsburgh’s defense may have some question marks, but they might have a future All Pro in Watt. After their first playoff appearance in this millennium, the Bills made a number of surprise moves in the off season. They traded starting quarterback Tyrod Taylor to the Cleveland Browns and drafted Wyoming’s Josh Allen in the first round of the NFL draft. The team opened the 2018 season by traveling to Baltimore to face the Ravens and it was the biggest slaughter of the NFL’s first week. It was a full system failure for Buffalo who mustered only a field goal on offense while giving up 47 points to Joe Flacco and company. Both Josh Allen and Nathan Peterman saw action at Quarterback, but the two combined to go 11 of 30 for 70 yards and two interceptions. People seem to keep forgetting that Tyreek Hill is a top tier wideout so Hill decided to treat his fantasy owners to a monster Week 1game. Hill caught seven passes for 179 receiving yards and looks totally in sync with second year quarterback Patrick Mahomes. The third year wideout also opened the games scoring by returning a punt 91 yards for a score. 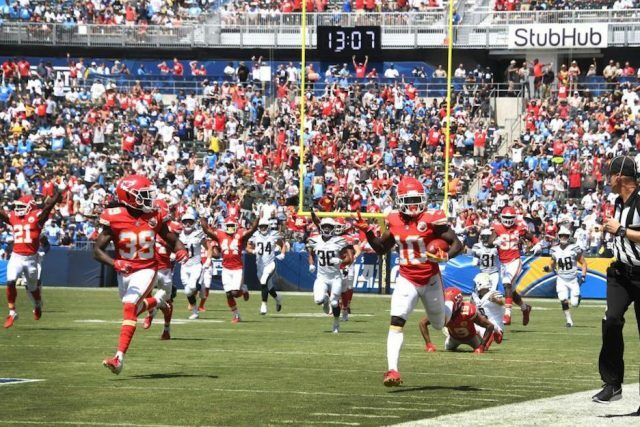 The Chargers secondary has been very hyped coming into the season, but Tyreek Hill left them in the dust Sunday afternoon. It was a really bad week for usually high calibre quarterbacks. Big Ben had a rough week, Matt Ryan was really bad, and Matt Stafford may have been the worst of them all. The Lions hosted the new look New York Jets on Monday Night Football where they were soundly routed. After an early Sam Darnold pick-six it looked like the Lions were going to run away with the game, but the was not the case. The Lion’s offense was never able to get going because of four Stafford interceptions. The Matt Patricia era is not off to a good start in Detroit. It seems that most fans of the NFL aren’t sure what the Oakland Raiders were thinking by trading Khalil Mack because despite missing all of training camp, he was an absolute force against the Packers Sunday Night. He recorded a sack, forced multiple holding calls, and even had an interception which he returned for a touchdown. Stats can’t do his performance justice though because he was creating havoc all night long. It was a thought to give this slot to the entire Cowboys team, but instead it’s going to just Dak Prescott. There is a lot of blame to go around for Dallas’ Week 1 one loss to the Panthers, but poor QB play was definitely one of them. He completed 19 of his 29 passes for 170 yards which isn’t a terrible stat line, but he didn’t do enough to help his team win. His offensive line didn’t do him a lot of favors in pass protection, but at least a couple of his six sacks were a result of poor pocket movement. Dak needs to be better moving forward. The Tampa Bay Buccaneers upset was surprising on its own, but the performance of Ryan Fitzpatrick was what shocked NFL fans. He finished the afternoon with a whopping 417 passing yards and five total touchdowns. The only reason he even started this game was because of the suspension of Jameis Winston, but he certainly made a case for being the team’s starter. The NFL made a big deal about how they were going to fix the catch rule in the off season, but after Week 1 it looks like it has gotten even worse. Julio Jones came down with a clear catch Week 1 against the Eagles but it was somehow ruled incomplete and it changed the complexion of the game. Gronk caught a ball that essentially bounced off the field and yet it was somehow ruled complete. It seems as though Al Riveron and NFL officials are now just going to be more inclined to stick with what is called on the field. It goes beyond the catch rule however, both Pittsburgh and Cleveland were slammed by absurd calls that changed the game. Myles Garrett was slapped with an absurd roughing the passer penalty that lead to a Pittsburgh score. Later in the game, a Pittsburgh punt went off the helmet of a Cleveland player and there was definitive video evidence, yet the call wasn’t overturned. Not a good look for the boys in black and white in Week 1.